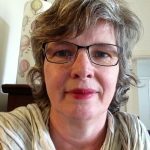 VIDA’s 16 Days of Activism Against Gender Violence series continues with Dianne Hall discussing how gendered familial roles in early modern Europe institutionalised family violence and influenced its treatment in the courts. Trying to address the huge problem of domestic violence in our society is fraught with many difficulties. One particular difficulty is that the underlying legal and social attitudes about violence by men against female partners seem so ingrained and resistant to change. A first step in shifting these attitudes is to understand where they have come from. 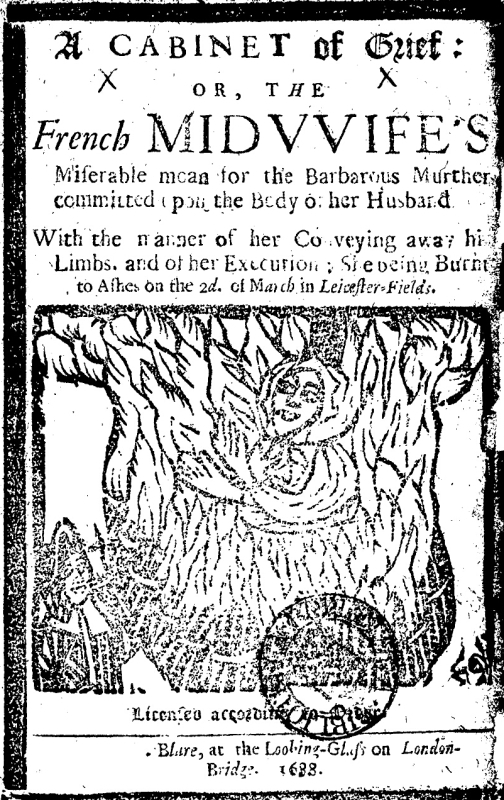 A Cabinet of Grief: Or, The French Midwife’s Miserable Moan for the Barbarous Murther Committed upon the Body of her Husband (London, 1688). © Adam Matthew Digital Ltd. Further reproduction prohibited without permission. I have been keen to delve deep into the history of domestic violence in Europe during the early modern period, between 1500 and 1800, when legal and social systems were evolving into the structures with which we are now familiar. Important assumptions about domestic violence were formed centuries ago and have been embedded into the deep substrata of Western social and legal systems and cultural mores. It might also seem odd to us, given the circumstances, that when William Wells was killed in Dublin nearly one hundred years later in the 1660s, by a sword blow from his tenant John Brough, it was both Brough and William’s wife Sarah who were convicted and then executed for the murder. John Brough’s defence – that William was “quarrelsome,” and that he had acted in self-defence when William had hit him with chamber pot – were dismissed. John was executed by being hung, drawn and quartered, while Sarah was burnt at the stake. The differences between the treatment of the killer of William Wells and Lord Howth are striking. And these differences were not just due to the difference in class status. Violence within the Wells and Howth families was understood through their relative positions within their households. Households were composed of the male head of the family, together with his wife and their children, but might also include a host of other dependants, ranging from elderly relatives to a variety of servants and employees. When violence occurred in such households, we can understand it in terms of what historian Philippa Maddern called a “moral hierarchy of violence,” where those in charge of the household had the moral authority to use violence to discipline those beneath them in the hierarchy. Wives and children were often expected to accept this discipline with resignation and patience, even if they thought it was unwarranted or excessive. However, violence towards the master by those lower down the hierarchy, such as wives and tenants, was never acceptable – no matter what the reason. 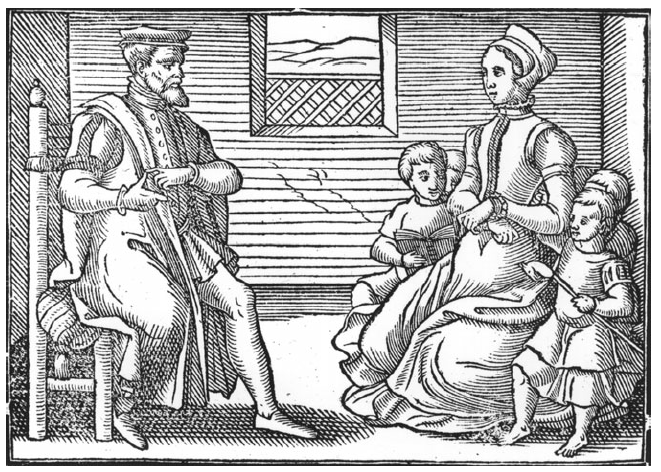 The legal and social meanings of domestic violence in early modern societies were thus a function of the position a person occupied within their household. Whole Book of Psalms (John Day: 1563). Image via Wikimedia Commons. But there were checks on this both legally but also socially. One of the main responsibilities of married men at the head of the households was to maintain order. He was expected to govern his household wisely and without recourse to uncontrolled force. If he was unnecessarily violent, his dependents, usually his wife, could appeal to various legal and social measures to try and make him abide by community standards. These could be publicly made promises, time in jail or even separation between husband and wife. At other times, neighbours and family would protect a beaten wife from her aggressive husband by pushing him away or hiding her. Conversely, as the Swedish Christopher Fischer wrote in 1613, it was a husband’s “greatest humiliation and shame, if he allowed himself to be subdued, ruled and criticised by a woman.” In other words, a man who failed to maintain control over his wife, or other household members, would find his standing within the community undermined. If a wife or dependant was reputed to be drunken, quarrelsome or violent, or if a wife was suspected of adultery, then the violence employed by a male householder was far more likely to be considered justified. Responsibility for discipline devolved down the household hierarchy, so that the wife of the male head also had power over subordinates, especially children, servants and apprentices. Again, discipline was exercised through varying degrees of physical force, and this was considered acceptable so long as it was not motivated by anger or caused serious physical injury. Household violence was thus highly regulated, although distinguishing between acceptable and excessive force was not always a simple or easy matter. So this meant that William Wells was justified in throwing a chamber pot at this tenant John Brough – John was lower in the household hierarchy and this act was to meant to discipline him for being out drinking with Sarah. In contrast, Lord Howth would have been justified in using violence against his wife and daughter only if he was trying to correct them. Since this was not the case, and he beat them only because he was angry, this was not deemed acceptable and he was convicted of unauthorised violence. 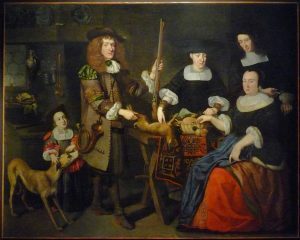 Barthélémi Hopfer, Portrait d’une famille strasbourgeoise (c. 1660-1670). Image via Wikimedia Commons. The moral hierarchy of authority also shaped the meanings of any violence directed against heads of household. This was most evident when women like Sarah Wells attacked their husbands, but also when servants or children used violence against either a master/father or a mistress/mother. Such actions attracted the most severe legal and social penalties. Any ambiguities surrounding the use of violence by husbands and fathers did not exist when violence was turned against them. Under English common law, which operated in Dublin at the time, a violent act by a woman against her husband or by a servant against a master was defined as petty treason. It was therefore comparable to when subjects attacked a king, because the man was ‘king’ in his own household. 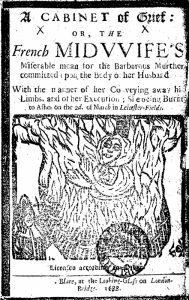 This meant that if a wife killed her husband, she was liable to be punished as if for treason: that is, by being burnt at the stake rather than hanged, as was usual in murder cases. A man convicted of treason was hung, drawn and quartered, as was John Brough’s fate. In Germany, the penalty inflicted upon a woman who murdered her husband was decapitation. While such prosecutions and convictions were not particularly common, a great deal of popular literature reinforced the legal code and revealed a general fascination with the concept of the rebellious wife. And bear my death in minde. Clearly, popular literature like this aimed to ensure that men and women knew their place in the household and knew what would happen if they disrupted it. 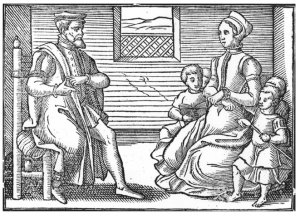 Early modern European understandings of family violence were different from our perceptions today, but this is not to say that violence occurring within households went unchecked. On the contrary, civil and religious courts, as well as communities, tried to control the violent behaviour of husbands and wives towards each other. All were in agreement that keeping households living and working cooperatively together was the desired object, and this normally entailed upholding the right of the male head of the household to discipline his dependants by forceful means. Arguments did not revolve around whether or not violence should be employed, but rather what levels and types of violence were necessary in order to guarantee household discipline. This makes me hopeful that as we redefine the meanings of violence as a society more generally, and then disrupt the assumptions about domestic violence which are rooted in very old understandings of the household, violence and discipline will disappear. WIRE, the Women’s Information and Referral Exchange Inc., is a free Victoria-wide service run by women, for women. It offers general information, support, and referrals. For further information about how to donate, click here. 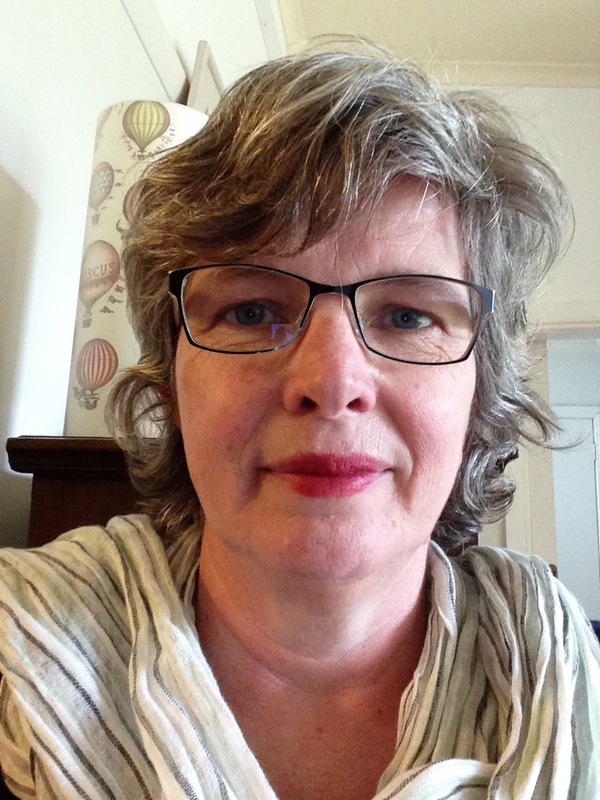 Dianne Hall is a Senior Lecturer in History, Victoria University, Melbourne. This blog post is based on research undertaken for Dianne Hall and Elizabeth Malcolm, “Sexual and Domestic Violence in Europe,” in The Cambridge World History of Violence Volume 3 – AD 1500-AD 1800, edited by Robert Antony, Stuart Carroll, Caroline Dodds Pennock (forthcoming, 2018). Dianne and Elizabeth are currently writing more on this topic in a book on gender and violence in Ireland between 1200 and 1900. Follow Dianne on Twitter @HistoryDH.